The coastline of the Cape Pillar Circuit is colossal in scale, highlighting some of the highest sea cliffs in the country standing at 300m above sealevel. 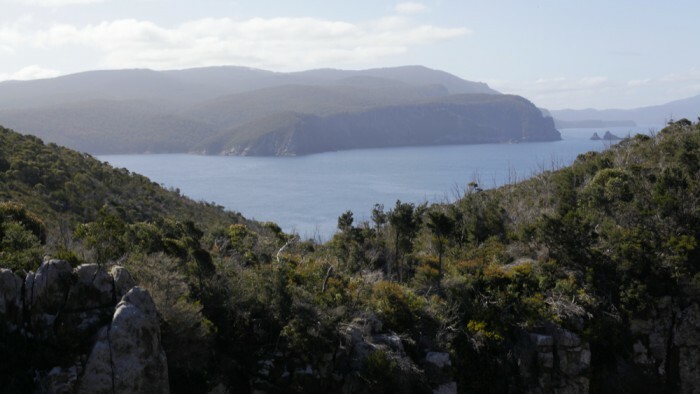 The 41km loop from Fortescue Bay presents walkers with remarkable and unrivalled views including Cape Hauy, Monument Lookout, Tasman Island and of course, Cape Pillar. With the 480m climb over Mount Fortescue included, this hike isn’t the easiest. Reward far surpasses the effort however, making the Cape Pillar Circuit a filling 3 day adventure. The later sections of the Cape Pillar Circuit follow the newly established Three Capes Track. This walk must be done in a anti-clockwise direction to help limit the spread of Phytopthora Cinnamomi (root rot). Camping is only available at Wughalee Falls. 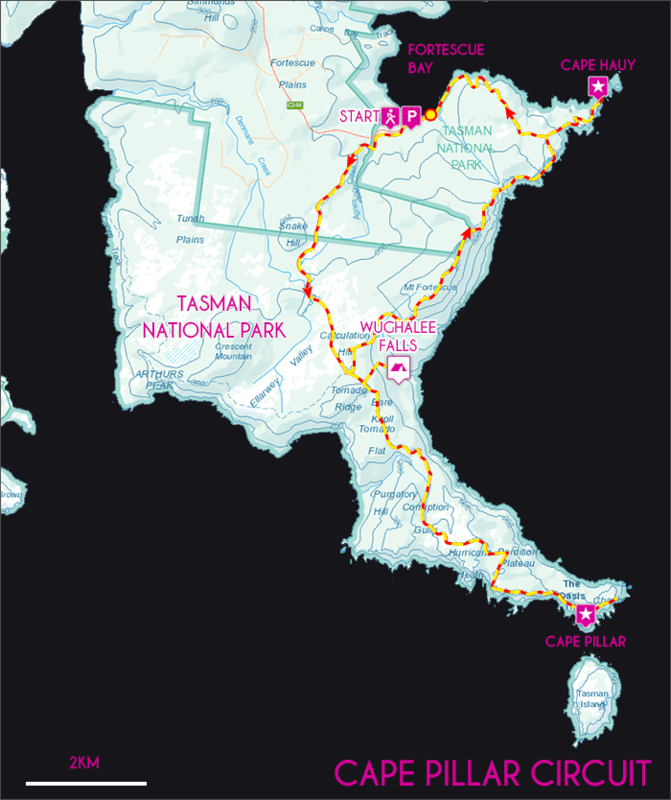 View Google Map Directions From Hobart head over the Tasman Bridge and continue on the Arthurs Highway (A9), turning right at the main intersection in Sorell (sign for Tasmanian Peninsula). Continue towards Port Arthur, taking the first left after the Tasmanian Devil Park, onto Fortescue Bay Road. This 12km gravel road leads to the Fortescue Bay camping area. The Cape Pillar circuit starts from inland track just before the Rangers Office. 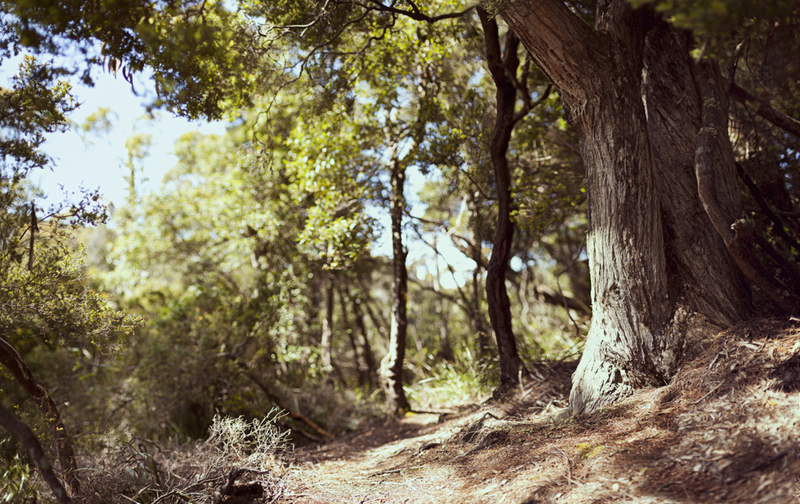 Beginning 100m before the ranger’s office at the Fortescue Bay camping area, the Cape Pillar Circuit gently climbs into the forest. Zigzagging through the initial section, Agnes Creek is first landmark crossed 20 minutes in. Beyond the creek, the trail climbs further entering sclerophyll forests. For the next few km as you approach Snake Hill, the trail varies from dense forest to boggy buttongrass plains. About 2 hours into the walk the Mount Fortescue junction is reached. This is where you will continue your journey to Cape Hauy after reaching Cape Pillar. Continuing on briefly, the side track to Wughalee Falls camping area is reached next. Wughalee Falls is now the only camping area available for independent walkers. Camping is no longer allowed at the other older sites. The side track to Wughalee Falls camp descends quickly to the lower section of Retakunna Creek before crossing to Wughalee Falls. Six camping platforms are available here. Water is often available in the creek or in the tanks provided. Please be warned that leeches and mosquitoes are extremely common here. Leaving larger packs at camp, the walk to Cape Pillar is best done as return day walk. From Wughalee Falls and Retakunna Creek the trail climbs steeply back up to meet the main Cape Pillar Track. Continuing to the south, the track winds along the sheltered side of Tornado Ridge, descending down towards Lunchtime Creek where drinking water is available. From Lunchtime Creek the trail climbs steeply for 300m before lessening as it reaches open grassy country at the top. From here the first coastal views are achieved, stretching west past Port Arthur and Cape Raoul before gently descending across the coastal heathlands of Ellarwey Valley. Continuing on, the view which makes Cape Pillar famous is quickly reached. 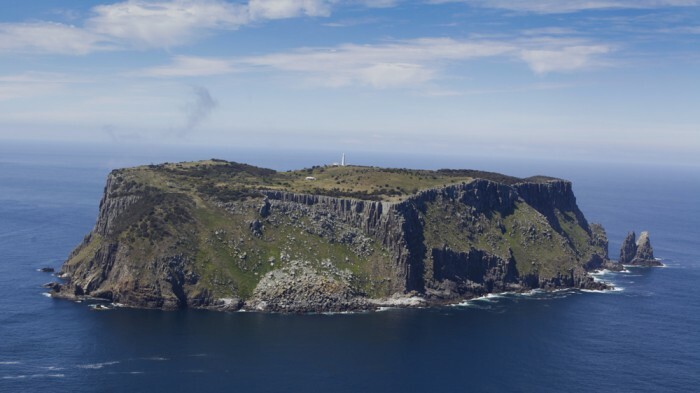 Views of Tasman Island and the spectacular cliffs of Cape Pillar, rising up to 300m above the raging seas below present themselves to you. The power of this place is outstanding, ungraspable and awe inspiring. The track then descends gently to the base of the Blade. With the most outstanding views from anywhere on the cape, climbing the Blade is a must. The climb onto the summit isn’t difficult, but it certainly isn’t for the faint hearted. Once at the top, Tasman Island in all its rugged beauty is directly ahead of you. Sweeping views of the brutal dolomite coast surround you including Cape Hauy and Maria Island to the north. Retrace your steps down from The Blade and head back to Wughalee Falls camp. Today’s hike is 16km and takes about 6 hours. The final day’s hike to Fortescue Bay via Cape Hauy includes a significant climb around Mount Fortescue. From Wughalee Falls camp meet the Three Capes Track again and continue to the right, this time taking the Mount Fortescue track. Walking here is uneventful, unfortunately no views are achieved around Mount Fortescue until the coastal cliffs are met nearing Cape Hauy. Once at Cape Hauy the first scramble down onto the cape is quite steep, but is easily managed. At the top of the first saddle extensive panoramic views stretch far north past the Forester coast to Maria Island and south, detailing the ridges of Cape Pillar. For the next 1km the trail rises and falls over the remaining two saddles, passing a large sinkhole on the left. Towards the end, the track borders very close to the cliffs edge providing thrilling views down at multiple points. The final segment of the trail before reaching a large plateau is quite steep. Once at the end the exceptional dolerite formations of the Candlestick and Totem Pole rise out of the ocean. Once back on the main track, the trail meanders downhill crossing two sections of flat scubland before entering dry sclerophyll forest. After another steep stair descent sheaoaks and banksias are past before eventually reaching the final coastal section just before the Fortescue Bay boat ramp. The trail skirts close to cliff edges at points, please don’t fall off. 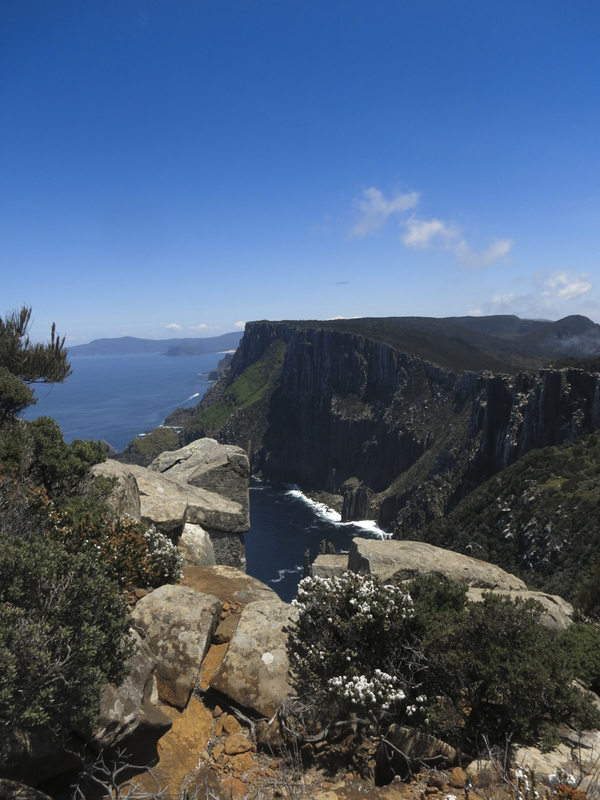 Winds at Cape Pillar can get to extreme strengths and like the rest of Tasmania, weather conditions can change in moments so be sure to pack appropriately.